Lagotto Romagnolo is a relatively young breed and his use has always been almost exclusively as a working dog. For this reason many of the people who contact us have not had previous experiences with this breed as a pet dog. They ask us about the character of the Lagotto Romagnolo. They wants confirmations on how much good and beautiful they read. The Lagotto Romagnolo has recently entered in the homes of families and for this reason a breed still to be discovered but the little Lagotti are giving important confirmations. The people who contact us talk about their furry friends. Terriers, beagle or settler or mestizo who loved to the point of not being able to stay without a dog. Now, after seeing and being informed about the temperament of the Lagotto Romagnolo, they choose him as their life partner. A family who has time and space, it also happens they have never had a dog, soon the family Lagotto become two. Families also with children who in one shot discover the love of the dog and the charm of Lagotto Romagnolo. The question often ends with a: “But really He is so? !” In fact it seems impossible that these little creatures are all that man always look for in a pet dog. The Lagotto Romagnolo is a working dog and he knows how to do it really well. 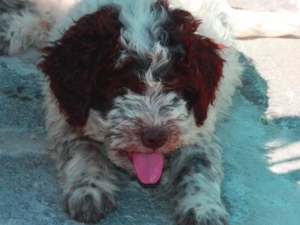 It is a feat to find the most appropriate adjectives to be used to describe the character of the Lagotto Romagnolo. To reassure that the Lagotto Romagnolo is just like that! We should tell a multitude of anecdotes and situations. 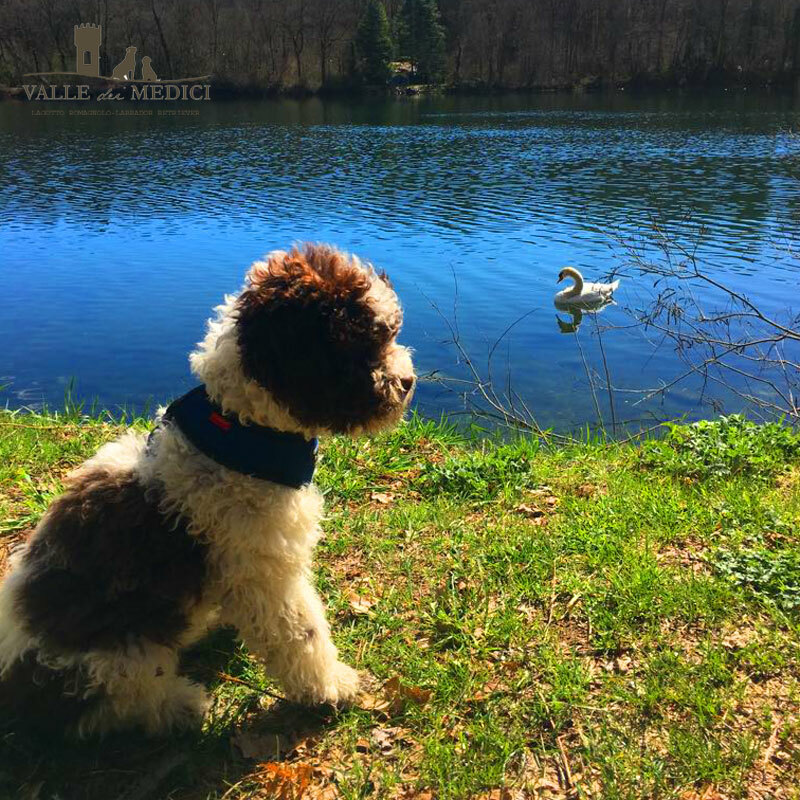 Only by experiencing the Lagotto you comprehend character intelligence and temperament. It also happens the children bring in the family the first Lagotto. Then the parents want the second one. The character of the Lagotto Romagnolo is a unique aspect of this breed. Affectionate and playful, patient with children and tireless playmate. Lively and entertaining outdoors as composed and respectful in the house. Smart! All adjectives that are well suited to the Lagotto Romagnolo, but only by living it is understood how he is the maximum expression. The fact that the Lagotto Romagnolo does not leave fur in the house is often seen as one more thing.. The temperament of the Lagotto Romagnolo is astonishing. The Lagotto dog knows how to be from apartment and at the same time brilliant and fun in the outdoor. Easily trainable and connected to the owner. The Lagotto always tries to please his reference humans. Both indoors and outdoors. Intelligent to understand at first time, and touty if someone does not recognize him this ability. He is a quiet dog and not bother, knows how to compose and wait. He turns into sticky when we cuddle him and he never tire of being cuddles. Don’t argue with other dogs. And he is docile to the point he would never bite anyone, much less a child. He’s not a bark dog. At most warn when there are unexpected visits. These are the characteristics of the Lagotto Romagnolo. Finding a flaw is really hard. 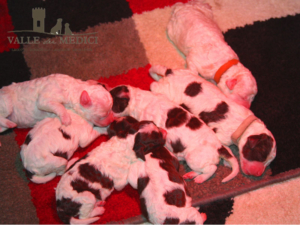 https://www.allevamentovalledeimedici.it/wp-content/uploads/2018/04/lagotto-romagnolo-famiglia-compagnia.jpg 800 800 Davide https://www.allevamentovalledeimedici.it/wp-content/uploads/2017/05/logo-VDM.png Davide2017-06-24 21:45:132019-01-27 20:46:14Temperament of Lagotto Romagnolo: a lagotto as a life PARTNER.